Patti, I requested a detailed explanation... but your first line does not serve as an answer to my request (since you are still not describing any details at all). It is only a fact that the Korean report does not describe at all how to find the point (in II-III) where the crease-parts get connected! So, your claim that you managed to do that by "using the guidelines from the report" ... is quite unlikely, because in the Korean report there are no guidelines presented for that purpose at all. And after saying this, don't you think it was only fair to ask for more details regarding your own observations that made you find the 'connecting point'. By the way, this shows the nature of how you CREATE 'standards'... regarding an objective that is not described in the Korean report at all: there are no formal 'requirements' described in the article for this purpose at all! Patti, your attempt to disqualify my arguments based on the width of the major creases is rather naieve... and could even indicate that you do not understand at all what you're talking about. Because I think this only requires a bit of common sense: we can quite safely assume that the 'flow' of the creases is indicated by the width variations inside the creases involved! And it is quite silly to see that you are simply disqualifying my detailed observations as 'opinions'... and after describing why I perceive your conclusion as rethorics only, you are now even suggesting that my observations are based on a 'double standard'. Patti, I now recognize how you have 'created' your own rules for our advanced explorations (which go beyond the purposes describe in the Korean article) regarding how to find the 'connecting point' inside the II+III part of the Suwon crease. ...I can only hope that you will recognize now as well that we are talking here about a topic that goes beyond the purpose of the article. Just like we were going beyond the borders of the article when discussing the 'extended distal transverse crease' - which concerns another topic where we had alreayd agreed that it is not covered by the Korean article. All guidelines described in figure 5 for crease III, are likewise applied on the other creases II and I. Thanks for pointing out that you understood as well that there can only be one implication of this line: figure 5C describes two requirements that are essential for recognizing a Suwon crease. "... while Suwon creases have accessory II, which is close to I." I think this implicates that the II+III part of the Suwon crease is always found at a certain distance positioned away from the life line, and indirectly this confirms that the requirement that the two parts of the head line are positioned 'parallel', is essential for the recognizeing a Suwon crease. Because your assumption here directly violates the requirement regarding: '...more than half of the length of...'. But I recognize how your 'reasoning' here is a direct result of where you located the connections in the Korean Suwon exmple + the example which Lynn re-introduced earlier this evening. Step 3 - in order end with a conclusion which appears to be a new assumption: that you assume that there is probably is no criterium presented at all. While Lynn's quote does presents two clearly distinctable criteria! And both the Suwon crease illustration and the guidelines in figure 5 can be described as confirming these two 'criteria'. Because the guideline in figure 5C is in the Korean article THE ONLY sentence that could directly serve as a definition for how to recognize an 'accessory crease'. This sentence indirectly suggests that the 'II+III' part of the Suwon crease will never be found connected with the life line. A Suwon crease requires the presence of: (1) two head lines, with (2) the upper head line is connected to the heart line, (3) both head lines are required to be positioned parallel to each other, (4) both head lines are required to have enough length, (5) and the upper head line is not connected with the life line. While you argue arbitrary points that are not in the report, you totally miss important criteria that is in the report. The endings of all creases, major and minor, are determined by their 'sharpened ends'. Your example below is actually a confirmation of the entended DTC reaching the radial edge when a PTC is present being related to a Suwon crease. The DTC tapers to the radial edge. You probably don't realize that Lynn is saying the opposite of what you are saying. You are stating that the II part of the II+III needs to be more than 1/2 the length of Accessory II. But, I'm glad to hear that you are both in agreement with each other. I don't see what's wrong with Patti's statement, or how it violates any requirement about length. ?? Patti... obvouisly you didn't notice that I responded to your comment only. "This defintion of accessory variant regarding crease III, implies that accessory II will also be parallel and more than half the length of II"
Which means that Lynn is only saying: the head line part in the fused line is more than half the length of II. Actually, I recognize, Lynn's word choice was probably a bit confusing by using the 'acessory' to refer the II part of the II+III. "Accessory II crease needs to be longer than 1/2 of the II part of II+III"
Which is not was Lynn described at all, because she was only 'translating' the guide from figure 5 from the III line to the II line... but she did not mention the the II+III at all!!! And Patti, because you didn't notice that... it no longer made sense how you started applying the length criterium on the 'accessory II' part of the Suwon crease by comparing it to the II-part of the II+III. Again, Lynn made here comment resulting directly from what is written in figure 5. And the article only talks about 'more than half of the' ... length of a full line! Not half of the length of the II part in the II+III. ... Again, I was only responding to your comment - not Lynn's comment! In the article the requirement regarding the length of the 'accessory III' line is putten in the perspective of a normal 'III' line. 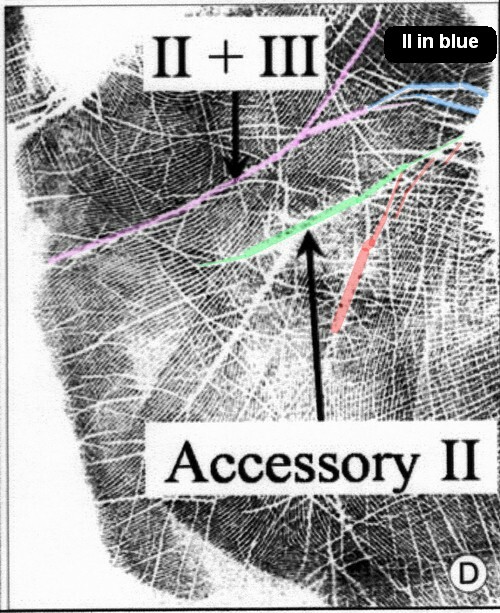 But in the Suwon crease we really need to adjust the criterium to the perspective that we are discussing, because in the Suwon crease the 'accessory II' line... can be described as the normal 'II' line...!!! I hope this makes sense so far? Now, in the perspective of the Suwon crease Patti is trying to put the 'length' criterium on only the 'accessory II'... but that concern the normal head line! My point is: that it in the Suwon crease it does not make sense to put the length criterium for the 'accessory II' in the perspective of the II part of the II+III... because obviously, that is not a normal 'II' at all!!! PS. In my former post I explained how Patti made herself an assumption based on a small confusing element in your words, because you wrote: "accessory II will also be parallel and more than half the length of II" ... but I understood that you only talking of an 'accessory II' in the perspective of the guidelines for figure 5.... and that you were not talking about the 'accessory II' of the Suwon crease! So, we really NEED to 'adjust' the vocabulary to apply the criterium described in fig 5 to the Suwon crease... otherwise this leads to nonsense! No Martijn, that wasn't what I was saying!! It seems that I have misunderstood something. Martijn, you misinterpreted what I was saying, Patti understood what I was saying!! I was indeed referring to the II part of III+II. After all, that is the only II in a suwon crease - the headline is accessory II. Yes absolutely, it seemed a ridiculous thing to say when I wrote it! If they are talking about accessory creases only in the perspective of being additional to the normal creases (ie 'sister lines') that makes perfect sense - as Patti already said before. As the article only talks about 'more than half of the' ... length of a full line! then we can't transfer the statement in fig 5 to a suwon crease, because II is not a full line. I don't seehow we can start 'adjusting vocabulary'. That would mean changing II to accessory II. Sorry I have not contributed anything at all useful to this discussion! I thought I understood it, but it seems I am very confused!!! I was well aware that Lynn meant that Accessory II was the Normal Head Line. If you actually read my words it's pretty obvious. We had this discussion earlier as to why the normal head line was called Accessory. No sense of humor around here? It was just funny to me that the actual words written were opposite and there was all this arguing and red letters over other minute details and this was overlooked. Again, I'd like to bring up a continously ignored point that is directly from the Suwon paper. 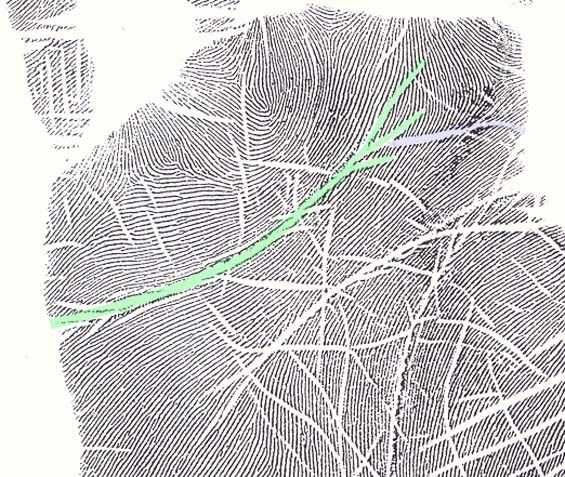 "First, major and minor palm creases were not strictly defined so that the relationships, branches, variants, and starting and termination points of major palm creases were not explicit." "The main purpose of this study was the presentation of improved methods of analyzing palm creases, the features of which include strict definition of the major and minor palm creases and the systematic classification of palm creases on the basis of their relationships, branches, and variants." "To define the major palm creases more strictly, the remnants (the minor palm creases) must be defined simultaneously." I think the "sharpened end" rule is VERY important in discerning the endings of major creases. I also mentioned last night that I thought that if II+III was to relate to II or III individually it would be in the report. So I searched the report to make sure I didn't miss something. In Fig. 4 the relationships of II and of III of the Simian and Sydney II+III's are discussed in their separateness. What I observed there was that all II branches are proximal and all III branches are distal in II+III. The only III examples or variants with proximal branches relate to the sharpened ends of III in Fig. 5. <edit> It's possible that Fig. 4, Simian 5 could have a distal branch from a tapering end of II or it could be a proximal ending branch from III touching II. Simian 5 would have to be studied carefully not to confuse it with Normal 2. My interpertation of this is that only normal and extended DTCs can have proximal branches at the radial edge with sharpened ends. The II or PTC that is rising to meet III or DTC must also follow these rules. It must have a sharpened end or be more narrow as it approaches and meets the DTC. Either the III DTC is ending radially with a sharpened end, or the II PTC is rising distally to meet III DTC with a sharpened end. I applied this important rule when I colored the parts of II+III in Fig. 3. Lynn wrote: No Martijn, that wasn't what I was saying!! It seems that I have misunderstood something. Martijn, you misinterpreted what I was saying, Patti understood what I was saying!! I was indeed referring to the II part of III+II. Okay Lynn, thanks for explaining your thoughts + what you exactly had in mind. And great to see that you were able to confirm that there indeed was a (small) mistake in your words. But I think you have not much to worry about... because I clearly recognize how this 'new' problem for your... is a direct result of how the Korean authors choose their vocabulary to describe the Sydney line and the Suwon crease!! I observe that that Korean researchers have made one (little) fundamental mistake in their vocabulary! Because there is a very strange element in their vocabulary choice, which relates directly to how they described in both definitions a NORMAL CREASE as an ACCESSORY crease...! This 'choice' simply doesn't make sense at all! But only now I see... that this is element that CREATES unnessary problems... and the problem that you are faced with (which you've described exellent in your post), is a clear illustration! ... then we would not have been confronted with the problem that you described at all! However, because I understand that your problem is directly resulting from this 'strange element' in the vocabulary of the Korean researchers.... I think you actually understood their guidelines properly (regarding the 'length' criterium), but now you appear to be a little bit confused - only because of the problem that you described. Lynn, I can only hope that you recognize as well... that 'your problem' would not have existed if the researchers had not made the FUNDAMENTAL MISTAKE in their vocabulary! ... Thanks for pointing out how you meant to present your comment, but Lynn was trying to point out a point seriously. By the way Patti, I also see no indication that you had spotted the 'little mistake' in the vocabulary of Lynn's argument; you also assumed that I made a wrong assumption, but at that moment I had not responded to that comment from Lynn at all! PS. In my last post I have pointed out that there is a fundamental mistake in the Korean vocabulary... and I have described a rather simple solution, which solves Lynn's (small) problem directly! We all did discuss this aspect from the very beginning and complained that a somewhat normal DTC or PTC should be labelled as Accessory. Yet, in the sense that II + III also represents a Simian without Accessories the concept works. II + III is a conjoined crease formed by both the DTC and the PTC. Martijn (admin) wrote: Okay Lynn, thanks for explaining your thoughts + what you exactly had in mind. And great to see that you were able to confirm that there indeed was a (small) mistake in your words.
" I don't understand why they are classing main headline as an accessory. ie why it is 'accessory II' as opposed to (main) II "
re great to see that you were able to confirm that there indeed was a (small) mistake in your words. erm,,, Did I confirm this? What mistake did I make in my words? yes I am seriously confused! If you choose to revise the Korean's report to fit your own descriptions - it would be advisable to make note that your version is just that, your version. Sorry, I don't remember you complaining about that aspect at all. And I am wondering... who is the 'we'? What I remember was that everybody - including myself - experienced problems in understanding what the Korean researchers had described in their article, and those problems related to both their words and their pictures. And I am wonderingl... who is the 'we'? Lynn, if you simply adopt the recommendation that I described for the formulas... your problem regarding how to apply the 'length' critirium is immediately solved. I hope you will try... and report the result! "(C): III is accompanied by accessory palm creases which are parallel and more than half of the III length." But it is crucial to notice here that figure 5C only mentions 'accessory palm creases' in the perspective of a NORMAL crease; and therefore I explained why in the perspective of the Suwon crease this criterium really has to be 'transformed'! Because it would be 'unintelligent' to apply this criterium litterally to how the researchers defined the Suwon crease, because obiously, in their definition of the Suwon crease the 'accessory II' IS the NORMAL head line... and formally it can not be described as an 'accessory palm crease' at all, because it IS the NORMAL crease! Again, Lynn... my proposal solves your problem (+ your confusion) permanently! Anyway, I think I have described in my earlier posts why it is NECESSARY to 'correct' this minor issue in the vocabulary used by the Korean authors... in order to solve multiple problems all at once. Any 'argument' that moves away from those facts as presented in the article... can fairly be described as a speculative 'opion'. Yet now you are saying that we need to transform something that they said. Is that a speculative opinion?? (EDIT: Regarding the comment that you are referring to, I made that comment in the perspective of the fact that Patti had started making considerations which went far beyond the contents of the article... and meanwhile she was not even willing to acknowledge the relevance of the criteria described in the article, specified to the guideline for figure 5c). Remember... what is relevant here is that we all experienced at least some problems with that the researcher described as normal head line as 'accessory II'. And don't you think that it would be a very sensible choice... if we can agree on the implications of my suggestion... to simply adopt that suggestion, especially since it solves multiple problems at once! The picture below would then be the result... and it would be quite 'stupid move' (I have never used this word before)... to disqualify this 'formal' improvement - solely with 'rethorics'! So, I observe that your 'rethoric question' might not be relevant here. Yes it makes sense to change it. All along I have not understood why they used their temrinology "accessory II" for main headline. I / we always thought that the main headline should be II and the part joined to the heartline should be accessory II.